Stampin' Up ideas and supplies from Vicky at Crafting Clare's Paper Moments: Tickety boo! I made a strip of three apertures using the Ticket punch (another item I can't live without!) and backed it with a layer of hand stamped 'designer paper'. The floral image was stamped in Basic Grey ink and coloured using an aquapainter and ink. I love how velvety the flowers look when the Pacific ink is layered. 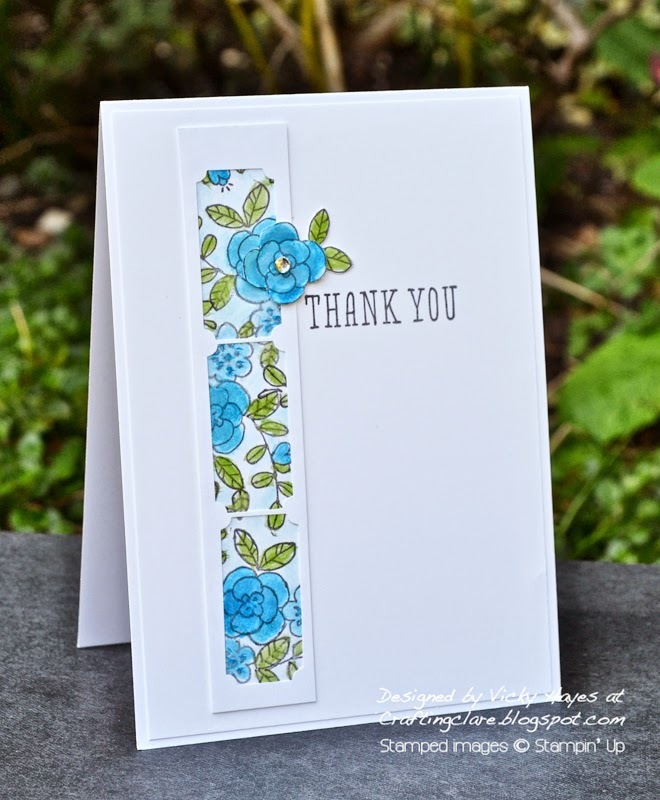 I make lots of thank you cards and this fabulous sentiment from the So Very Grateful set is a very welcome addition to my repertoire! I embellished it with a fussy cut flower and leaves and added a single gem. I'll be linking this card up with Dynamic Duos where the colour palette is Gumball Green plus one colour of your choice (mine is Pacific Point of course.) It also fits in with CAS Colours and Sketches where the sketch is one of my all time favourite layouts! You may have noticed that I'm now on Twitter as well as facebook and Youtube. My daughter was very encouraging when I told her I was going to sign up for Twitter. "I think it's a great idea," she said enthusiastically. "What will you tweet about?" I hesitated. "Well, you know, inspiration, photos, offers and news about Stampin' Up." She nodded. "Like: Crafting is rad as heck! Everybody buy stamps!" she suggested. "Or: Have you heard the news? STAMPS!!!" "Erm..." I said weakly but she was just getting into her stride. "How about simply: Crafting - am I right?!" Hello Vicky, your card is beautiful, and I love the idea of the ticket stamp. I really must try using stamps as design paper. Off to vinnie van for a few days. You are SOOOO right! LOL! This card is brilliant and I love the ticket idea on the designer paper. Very pretty Vicky, love the style of the sentiment and the overhanging flower. Beautiful card Vicky. Love that blue and the ticket punch frame is a fab idea! Ingenious design AGAIN Vicky, just wish I could get into that head of yours for an hour or 2, nah! it wouldn't last in mine, I'd have forgotten it before the third lot went in LOL. I too love this stamp set! Great use of the sketch - love the extra flower breaking the box! 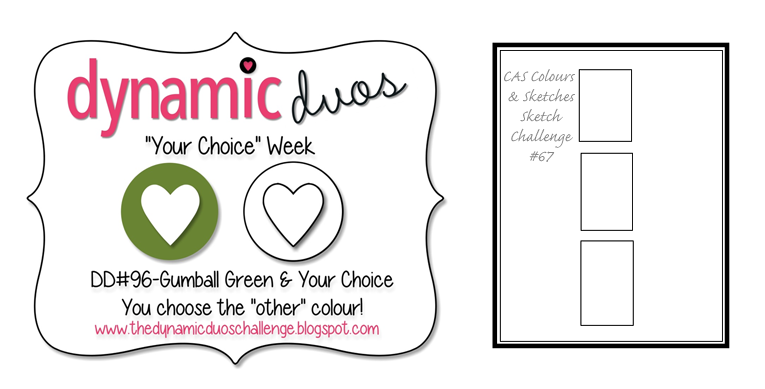 Thanks so much for playing along with us at CAS Colours & Sketches! Absolutely amazing! Wow! I love your panels and the design of your card and the color combo really pops!